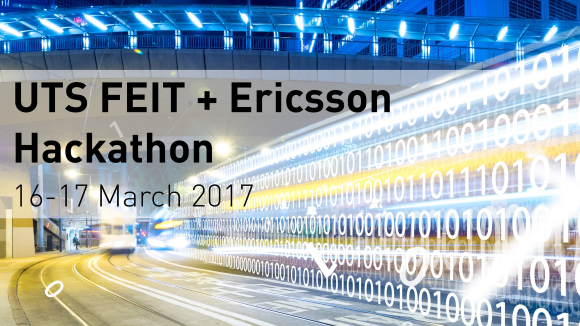 UTS Faculty of Engineering & IT and Ericsson are giving you the chance to team up and create real, innovative, market-changing IoT solutions; receive industry mentoring and build professional networks with the Internet of Things for Smart Cities Hackathon. For those who don't know what a hackathon is — no actual hacking skills are required, we like to think of it as 'ideas hacking' to find solutions to problems using the engineering and IT skills you have. Because having practical experience before you graduate is what it's all about here at UTS, we've got you sorted! Students may be invited to continue developing their hackathon project throughout the semester as part of the Software Development Studio subject or Engineering Capstone (for eligible students) meaning you're developing real projects for credit points. © Copyright UTS - CRICOS Provider No: 00099F - 22 February 2017 03:14 PM. The page is authorised by Deputy Vice-Chancellor and Vice-President (Corporate Services).